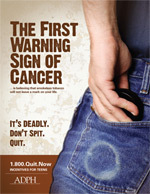 The Tobacco Prevention and Control Program provides Alabama Tobacco Quitline materials for distribution. Materials include brochures, business cards, easels and flyers. Download and print the high-resolution PDFs below, or order these materials by contacting Julie Hare at (334) 206-3830 or julie.hare@adph.state.al.us, or contact Kim Cole at (334) 206-9454 or Kimberly.Cole@adph.state.al.us. 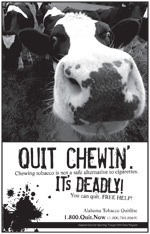 Help make the future of Alabama tobacco-free! Adapted from the Wyoming Through With Chew Program.